It's 2015 and the way things are looking, smartphone manufacturers - especially ones hailing from China - are rampaging against the screen bezel. What used to be a niche is now a small crusade that's invading markets left and right, laughing at you for buying an expensive smartphone whose screen bezels are wider than a hair's width. From Oppo and Sharp all the way to LG & Samsung, slim screen bezels are slowly but surely becoming a characteristic of high-end smartphones. It will only be a matter of time before bezels go the way of the dinosaur and all Android flagships start looking like Sharp's AQUOS Crystal phones. Don't believe us? Okay, we're not futurelogists, but judging by the examples we've shown here, the industry already has a headstart. So join us for a trip through no bezel's land - there are some nice sights to be seen here! Long before anyone cared how big their screen bezels were, Motorola marketed the Razr i as wielding the first edge-to-edge display. Alas, the (partly) successful exercise in eliminating the side bezels was made futile by the smartphone's incredibly bulky frame! But underneath all that girth hides a smartphone that was both well equipped for its time and aware of future design trends! The Moto Razr i has a Gorilla Glass-covered 4.3-inch Super-AMOLED screen with a 540x960 resolution and runs on an Intel Atom Z2460 chipset with a PowerVR SGX540 GPU. It also has as much RAM as the latest iPhone (1GB). It also rocks an 8-megapixel cam, and it's powered by a 2000mAh battery. The operating system is Android 4.1.2. Overall, we'd say this one holds up pretty well, although the latest achievements in smartphone design render make it look quite unflattering. Sharp's later smartTV and smartphone output has the "look ma, no bezel!" look as its defining characteristic. Indeed, the company hates screen bezels as much as it loves spelling everything in uppercase! The Sharp AQUOS ZETA SH0-01G is a recent example of the company's EDGEST design philosophy in motion, giving you a nearly all-screen experience. The 5.5-inch 1080p display reaches to all sides and covers over 80% of the smartphone! In addition, the gadget runs on Qualcomm's capable Snapdragon 801 chipset and has 2GB of RAM, 32GB of storage, a 13.1-megapixel main cam, 4K video recording, and operates with Android 4.4 KitKat. Unfortunately, Sharp never brought it outside Japan, as it is an exclusive to local carrier Docomo. This compact smartphone extraordinaire that looks almost otherwordly, but then again, Japan is another world. The Sharp SH-04F somehow fits a 5.4-inch display in a 140 x 74 x 9.3 mm chassis and even has IP57 protection against water and dust. Specs-wise, this righteous Monster from Asia sports a quad-core Snapdragon 801 chipset, an Adreno 330 GPU, 2 gigs of LPDDR3 RAM, 32GB of internal storage, a 13.1MP main cam, and a hearty 3300mAh battery. The operating system is Android 4.4.2 KitKat. All is fine and well with this Japanese exclusive, but to get the screen bezel so thin, Sharp had to thicken the backside a fair bit. But if you like a bit of heft to your smartphone, this one will feel just right... until you ask about the price, that is. Importing from Japan could run you $850 without the taxes and postage. Yikes! Unlike the previous models, this one is up for grabs on T-Mobile and Boost Mobile. A fine, if cautious entry in the American market for Sharp, the Aquos Crystal looks incredibly modern on the outside, but it's a budget device at heart with its 5-inch 720p display, 1.2 quad-core Snapdragon 400 SoC, 1.5GB of RAM, and puny 8GB of storage. The handset is powered by a 2040mAh battery, which is actually appropriate for its configuration, based on a low-power CPU and a frugal IGZO screen. The AQUOS Crystal X offers more of the same. In fact, we're puzzled as to why Sharp didn't bring it along to the US and outright impress everybody with it! This one has the same stunning good looks, but sports a 5.5-inch 1080p display, a Snapdragon 801 CPU buzzing at 2.3GHz, 2GB of RAM, 32GB of storage, and is powered by a 2610mAh battery. It's also a little bigger at .5 inches (139mm) height, 2.9 inches (73mm) width, and 0.43 inches (11mm) thickness. Although Motorola was the first major smartphone producer to make a slim bezel effort, LG was the first to show mass consumers the beauty of downright thin side frames. This happened with the LG G2, a smartphone that we fondly remember as the best handset of 2013. It remained compact, despite having a 5.2-inch display, ran as great as that year's Nexus 5 did, and gave LG a nice and well-deserved place in the smartphone market. We can say much of the same for the LG G3, which didn't reduce the screen bezels any further, but made another statement about their design and space-saving benefits. It's still one of the handiest 5.5-inch smartphones you can get your mitts on! Always one to enthusiastically experiment with risky technology, this time Oppo toyed with a special design which diffracts light at the very edges of the smartphone's body, thus creating the illusion of invisible bezels. The experiment result is a 5.5-inch smartphone, probably named the Oppo R7, with virtually nothing on its sides, save for a slim frame holding things together. It's quite a sight to behold and the smartphone is bound to turn some heads when it comes out. Unless you're a Chinese resident, LeTV probably isn't a brand you are aware of, but the smartphone it has in the making is a wonderful introduction. It's a truly bezel-less device that doesn't look incredibly futuristic like Sharp's Crystal phones, but is nevertheless very stylish. All we know about it is purely rumor-based, but if rumors spell any truth, then the LeTV device will have a 5.5-inch 1080p display, an octa-core chip running at 2.2GHz, 2GB of RAM, 16GB of storage, a 13MP main cam, a 5MP front cam, dual-SIM connectivity, and the new USB Type C connector which is small and does everything! This smartphone has our attention for sure, so hopefully, it won't be one to disappoint. The Subor S3 is marketed as "the world's first dual-4G smartphone without bezels", which rings out nicely in the ears, but alas, there isn't much of a smartphone to be had here. 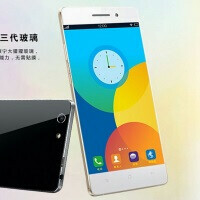 What we're seeing is a poorly photoshopped Gionee Elife S5 lookalike with a 5-inch 720p display, a quad-core MTK6732 chip, 1GB of RAM, and 8GB of storage space. However, there are two 8MP cameras on it to compensate for the so-so hardware. The phone is powered by a 1700mAh battery. Although it looks quite fake from the images, the Subor S3 is actually on sale in China, and the curious among you can probably import it from international resellers. The Samsung Galaxy S6 edge eliminates screen bezels with sheer innovation, opting to bend the display itself so it flows along the edges rather than seek ways to cut even more plastic (metal, in this case) from the device without making it a pain to use. As for the specs, you probably know them by heart at this point - 1440x2560 Super AMOLED display, octa-core Exynos 7420 SoC, 3GB of LPDDR4 RAM, super fast UFS 2.0 flash storage, 16MP main camera, and just gobs of performance power. A true bezel-less superphone! So, what do you think of the bezel-less trend? Which one of these phones do you like the most? Tell us in the comments! Its unique, the curve looks like it doesnt have bezels. haters going to hate. I didn't see any numbers or rankings in the article. They should focus more on making a better phone in general, rather than some kids fantasy of slim bezels. Little bezel yes but don't like zero bezel looks awkward to hold. Where is the Xperia zl? Sharp should market their phones to more countries. Still rocking the Droid Razr M as backup (for those who forgot, the Razr i is basically the Razr M with Intel's processor). Still got enough punch in it to run Lollipop. S6 Edge and the Crystal X are the most appealing phones. They should've at least made the top and bottom bezels thinner like the LG G3 if they're going for the wow factor. So is that a definite confirmation that the Crystal X won't be leaving Japan after all... I mean, I know it was a little optimistic of me to have been sitting here for 3 months hoping someone would say something about it again, but... hope springs eternal, after all. I don't think I would like a bezel-less phone. Looks wise, I think they're great. Functionally speaking, I could see the edges of my fingers touching the edges of the phone while I hold it. If I put a bumper case on, I feel like the lack of a bezel will make the phone harder to use. with that type of case.